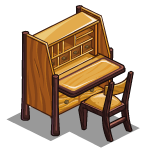 Notes: Secretary Desks are in the market and healed with 5 Paper Pushers (Wall Post). Strong Perfumes are a Direct Request. Notebooks are crafted.